• Erica Klarreich, In game theory, no clear path to equilibrium, Quanta, 18 July 2017. Economists like the concept of ‘Nash equilibrium’, but it’s problematic in some ways. This matters for society at large. The great thing about Nash equilibria is that their meaning is easy to fathom, and they exist. John Nash won a Nobel prize for a paper proving that they exist. His paper was less than one page long. But he proved the existence of Nash equilibria for arbitrary multi-player games using a nonconstructive method: a fixed point theorem that doesn’t actually tell you how to find the equilibrium! The idea is that each player chooses their action according to their observation of the value of the same public signal. A strategy assigns an action to every possible observation a player can make. If no player would want to deviate from the recommended strategy (assuming the others don’t deviate), the distribution is called a correlated equilibrium. This might at first sound like an arcane construct, but in fact we use correlated equilibria all the time—whenever, for example, we let a coin toss decide whether we’ll go out for Chinese or Italian, or allow a traffic light to dictate which of us will go through an intersection first. • Christos H. Papadimitriou and Tim Roughgarden, Computing correlated equilibria in multi-player games, J. ACM 55 (2008), 14:1-14:29. Do you know something about correlated equilibria that I should know? If so, please tell me! • David S. Wilson and Alan Kirman, editors, Complexity and Evolution: Toward a New Synthesis for Economics, MIT Press, Cambridge Mass., 2016. • Joshua M. Epstein and Julia Chelen, Advancing Agent_Zero. Abstract. Agent_Zero is a mathematical and computational individual that can generate important, but insufficiently understood, social dynamics from the bottom up. First published by Epstein (2013), this new theoretical entity possesses emotional, deliberative, and social modules, each grounded in contemporary neuroscience. Agent_Zero’s observable behavior results from the interaction of these internal modules. When multiple Agent_Zeros interact with one another, a wide range of important, even disturbing, collective dynamics emerge. These dynamics are not straightforwardly generated using the canonical rational actor which has dominated mathematical social science since the 1940s. Following a concise exposition of the Agent_Zero model, this chapter offers a range of fertile research directions, including the use of realistic geographies and population levels, the exploration of new internal modules and new interactions among them, the development of formal axioms for modular agents, empirical testing, the replication of historical episodes, and practical applications. These may all serve to advance the Agent_Zero research program. It sounds like a fun and productive project as long as one keeps ones wits about one. It’s hard to draw conclusions about human behavior from such simplified agents. One can argue about this, and of course economists will. But regardless of this, one can draw conclusions about which kinds of simplified agents will engage in which kinds of collective behavior under which conditions. Basically, one can start mapping out a small simple corner of the huge ‘phase space’ of possible societies. And that’s bound to lead to interesting new ideas that one wouldn’t get from either 1) empirical research on human and animal societies or 2) pure theoretical pondering without the help of simulations. • Kate Douglas, Orthodox economics is broken: how evolution, ecology, and collective behavior can help us avoid catastrophe, Evonomics, 22 July 2016. For simplicity’s sake, orthodox economics assumes that Homo economicus, when making a fundamental decision such as whether to buy or sell something, has access to all relevant information. And because our made-up economic cousins are so rational and self-interested, when the price of an asset is too high, say, they wouldn’t buy—so the price falls. This leads to the notion that economies self-organise into an equilibrium state, where supply and demand are equal. Real humans—be they Wall Street traders or customers in Walmart—don’t always have accurate information to hand, nor do they act rationally. And they certainly don’t act in isolation. We learn from each other, and what we value, buy and invest in is strongly influenced by our beliefs and cultural norms, which themselves change over time and space. Using a mathematical model of price fluctuations, for example, Bell has shown that prestige bias—our tendency to copy successful or prestigious individuals—influences pricing and investor behaviour in a way that creates or exacerbates market bubbles. This is where biologists might help. Some researchers are used to exploring the nature and functions of complex interactions between networks of individuals as part of their attempts to understand swarms of locusts, termite colonies or entire ecosystems. Their work has provided insights into how information spreads within groups and how that influences consensus decision-making, says Iain Couzin from the Max Planck Institute for Ornithology in Konstanz, Germany—insights that could potentially improve our understanding of financial markets. Take the popular notion of the “wisdom of the crowd”—the belief that large groups of people can make smart decisions even when poorly informed, because individual errors of judgement based on imperfect information tend to cancel out. In orthodox economics, the wisdom of the crowd helps to determine the prices of assets and ensure that markets function efficiently. “This is often misplaced,” says Couzin, who studies collective behaviour in animals from locusts to fish and baboons. By creating a computer model based on how these animals make consensus decisions, Couzin and his colleagues showed last year that the wisdom of the crowd works only under certain conditions—and that contrary to popular belief, small groups with access to many sources of information tend to make the best decisions. That’s because the individual decisions that make up the consensus are based on two types of environmental cue: those to which the entire group are exposed—known as high-correlation cues—and those that only some individuals see, or low-correlation cues. Couzin found that in larger groups, the information known by all members drowns out that which only a few individuals noticed. So if the widely known information is unreliable, larger groups make poor decisions. Smaller groups, on the other hand, still make good decisions because they rely on a greater diversity of information. 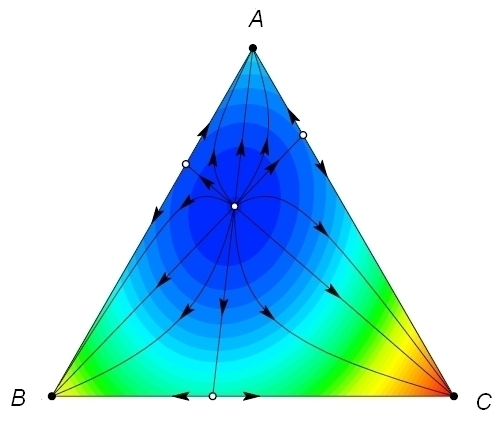 Taking into account such effects requires economists to abandon one-size-fits-all mathematical formulae in favour of “agent-based” modelling—computer programs that give virtual economic agents differing characteristics that in turn determine interactions. That’s easier said than done: just like economists, biologists usually model relatively simple agents with simple rules of interaction. How do you model a human? For Kirman, viewing economies as complex adaptive systems might help us understand how they evolve over time—and perhaps even suggest ways to make them more robust and adaptable. He’s not alone. Drawing analogies between financial and biological networks, the Bank of England’s research chief Andrew Haldane and University of Oxford ecologist Robert May have together argued that we should be less concerned with the robustness of individual banks than the contagious effects of one bank’s problems on others to which it is connected. Approaches like this might help markets to avoid failures that come from within the system itself, Kirman says. I’m wondering whether anyone has attempted to compute the value of the whole Universe, in dollars. This strikes me as a crazy idea—a kind of reductio ad absurdum of the economist’s worldview. But people have come pretty close, so I figure it’s just a matter of time. We might as well try it now. • Wikipedia, Payment for ecosystem services. • Robert Costanza et al, The value of the world’s ecosystem services and natural capital, Nature 387 (1997), 253–260. Abstract. The services of ecological systems and the natural capital stocks that produce them are critical to the functioning of the Earth’s life-support system. They contribute to human welfare, both directly and indirectly, and therefore represent part of the total economic value of the planet. We have estimated the current economic value of 17 ecosystem services for 16 biomes, based on published studies and a few original calculations. For the entire biosphere, the value (most of which is outside the market) is estimated to be in the range of US $16–54 trillion (1012) per year, with an average of US $33 trillion per year. Because of the nature of the uncertainties, this must be considered a minimum estimate. Global gross national product total is around US $18 trillion per year. You can read the paper if you’re interested in the methodology. • Robert Costanza, Changes in the global value of ecosystem services, Global Environmental Change 26 (2014), 152–158. They also estimated a $4.3–20.2 trillion loss of ecosystem services due to land use change during the period from 1997 to 2011. While still difficult to define, this loss per year could be more meaningful than the total value of ecosystem services. Sometimes a change in some quantity can be measured even when the quantity itself cannot: a famous example is the electrostatic potential! • Edward Witten, Cosmic separation of phases, Phys. Rev. D 30 (1984), 272–285. Protons and neutrons are made of up and down quarks held together by gluons. Strange quarks are more massive and thus only show up in more short-lived particles. However, at high pressures, when nuclear matter becomes a quark-gluon plasma, a mix of up, down and strange quarks could have less energy than just ups and downs! The reason is the Pauli exclusion principle. You can only fit one up and one down in each energy level (or two, if you count their spin), so as you pack in more the energy has to increase. But adding strange quarks to the mix means you can pack 3 quarks into each energy level (or 6, counting spin). So, you can have more quarks at low energies. At high pressures, this effect will become more important than the fact that strange quarks have more mass. • Fridolin Weber, Strange quark matter and compact stars, Progress in Particle and Nuclear Physics 54 (2005), 193–288. Unfortunately, nobody has seen evidence for them, as far as I can tell. But the really weird part is that Witten’s calculations suggested that ‘strange matter’, containing a mix of up, down and strange quarks, could even be more stable than normal matter at ordinary temperatures and pressures! His calculation was very rough, so I wouldn’t take this too seriously. The fact that we don’t actually see strange matter is a very good sign that it’s not more stable than ordinary matter. In principle ordinary matter could be just ‘metastable’, waiting to turn into strange matter under the right conditions—sort of like how water turned into ice-9 in Kurt Vonnegut’s novel Cat’s Cradle. But it seems implausible. Nonetheless, when the Relativistic Heavy Ion Collider or RHIC was getting ready to start colliding nuclei at high speeds at the Brookhaven National Laboratory, some people got worried that the resulting quark-gluon plasma could turn into strange matter—and then catalyze a reaction in which the whole Earth was quickly transformed into strange matter! This is interesting example of a disaster that would have huge consequences, that is very improbable, but for which it’s hard to estimate the precise probability—or the precise cost. the chance of this happening is like you winning the major prize on the lottery 3 weeks in succession; the problem is that people believe it is possible to win the lottery 3 weeks in succession. • R.L. Jaffe, W. Busza, J.Sandweiss and F. Wilczek, Review of speculative “disaster scenarios” at RHIC, 1999. 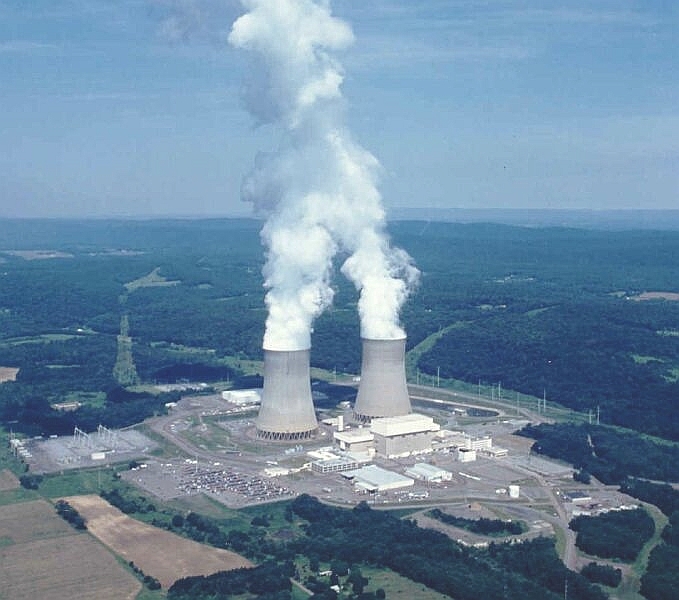 In 2000, a lawyer and former physics lab technician named Walter L. Wagner tried to stop experiments at RHIC by filing federal lawsuits in San Francisco and New York. Both suits were dismissed. The experiment went ahead, nuclei of gold were collided to form a quark-gluon plasma with a temperature of 4 trillion kelvin, and we lucked out: nothing bad happened. • Richard A. Posner, Catastrophe: Risk and Response, Oxford U. Press, Oxford, 2004.
in which a distinguished US judge attempted to do a cost-benefit analysis of the Relativistic Heavy Ion Collider. He estimated a $600 million cost for constructing the device and a $1.1 billion cost for operating it for ten years (discounted at a rate of 3% per year). He guessed at a potential total benefit of $2.1 billion—which he said was probably a huge overestimate. This gave a net benefit of $400 million. Then he took into account the risk that the experiment would destroy the Earth! He very conservatively estimated the price of a human life at $50,000. He multiplied this by the number of people now living, and doubled the result to include the value of all people who might live in the future, getting $600 trillion. This may seem odd, but discounting the value of future goods can make even an endless stream of future human lives have a finite total value. More annoying to me is that he only took humans into account: as far as I can tell, he did not assign any value to any other organisms on the Earth! But let’s not make fun of Posner: he freely admitted that this result was very rough and perhaps meaningless! He was clearly just trying to start a discussion. His book tries to examine both sides of every issue. Anyway: his estimate of the cost of human extinction was $600 trillion. He then multiplied this by the probability that RHIC could wipe out the human race. He estimated that probability at 1 in 10 million per year, or 1 in a million for a ten-year-long experiment. So, he got $600 million as the extra cost of RHIC due to the possibility that it could make the human race go extinct. Taking the net benefit of $400 million and subtracting this $600 million cost of our possible extinction, he got a negative number. So, he argued, we should not turn on RHIC. Clearly there are lots of problems with this idea. I don’t believe the entire human race has a well-defined monetary value. I’m inclined to believe that monetary value only makes sense for things that you can buy and sell. But it’s not so easy to figure out the ‘correct’ way to make decisions that involve small probabilities of huge disasters. Suppose, just for fun, that we accept Posner’s $600 trillion estimate for the value of the Earth. What then is the value of the Universe? I think it’s a stupid question, but I feel sure someone is going to answer it someday, so it might as well be me. Maybe someone has already done it: if so, let me know. But let me give it a try. I’ll be very relaxed about this, so it won’t take long. We could try to calculate the value of the Universe by estimating the number of planets with intelligent life and multiplying that by $600 trillion. It’s very hard to guess the number of such planets per cubic megaparsec. But since the Universe seems to extend indefinitely, the result is infinite. That’s my best estimate: infinity! But that’s not very satisfying. What if we limit ourselves to the observable Universe? No matter what I say, I’ll get in trouble, but let me estimate that there’s one intelligent civilization per galaxy. A conservative estimate is that there are 100 billion galaxies in the observable universe. There might be twice as many, but perhaps a lot of them are small or less likely to support life for various other reasons. 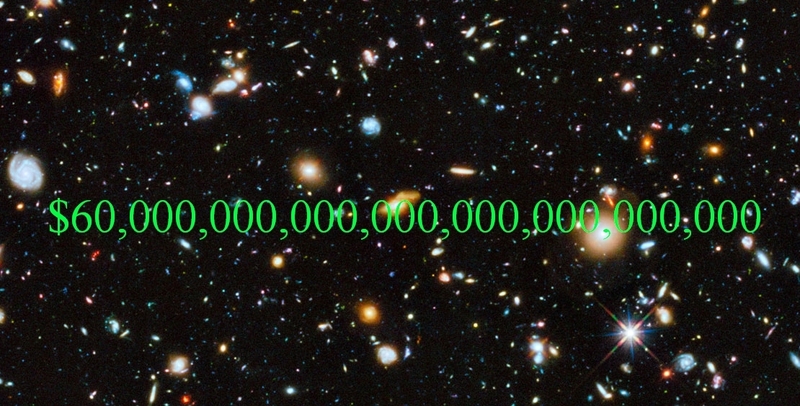 as my estimate of the value of the observable Universe. That’s $6 × 1025, or $60 septillion. This is my first post to Azimuth. It’s a companion to the one by Alaistair Jamieson-Lane. I’m an assistant professor at the University of Waterloo in Canada with the Centre for Knowledge Integration, or CKI. Through our teaching and research, the CKI focuses on integrating what appears, at first blush, to be drastically different fields in order to make the world a better place. The very topics I would like to cover today, which are mathematics and policy design, are an example of our flavour of knowledge integration. However, before getting into that, perhaps some background on how I got here would be helpful. For about eight years, I have focused on various problems related to long-term forecasting of social and technological change (long-term meaning in excess of 10 years). I became interested in these problems because they are particularly relevant to how we understand and respond to global environmental changes such as climate change. In case you don’t know much about global warming or what the fuss is about, part of what makes the problem particularly difficult is that the feedback from the physical climate system to human political and economic systems is exceedingly slow. It is so slow, that under traditional economic and political analyses, an optimal policy strategy may appear to be to wait before making any major decisions – that is, wait for scientific knowledge and technologies to improve, or at least wait until the next election . Let somebody else make the tough (and potentially politically unpopular) decisions! The problem with waiting is that the greenhouse gases that scientists are most concerned about stay in the atmosphere for decades or centuries. They are also churned out by the gigatonne each year. Thus the warming trends that we have experienced for the past 30 years, for instance, are the cumulative result of emissions that happened not only recently but also long ago—in the case of carbon dioxide, as far back as the turn of the 20th century. The world in the 1910s was quainter than it is now, and as more economies around the globe industrialize and modernize, it is natural to wonder: how will we manage to power it all? 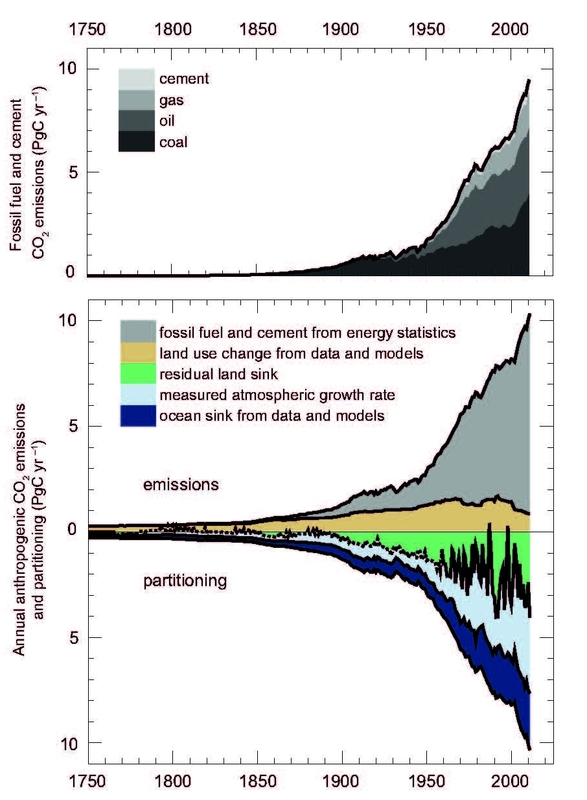 Will we still rely so heavily on fossil fuels, which are the primary source of our carbon dioxide emissions? Such questions are part of what makes climate change a controversial topic. Present-day policy decisions about energy use will influence the climatic conditions of the future, so what kind of future (both near-term and long-term) do we want? Many approaches can be taken to answer the question of what kind of future we want. An approach familiar to the political world is for a leader to espouse his or her particular hopes and concerns for the future, then work to convince others that those ideas are more relevant than someone else’s. Alternatively, economists do better by developing and investigating different simulations of economic developments over time; however, the predictive power of even these tools drops off precipitously beyond the 10-year time horizon. The limitations of these approaches should not be too surprising, since any stockbroker will say that when making financial investments, past performance is not necessarily indicative of future results. We can expect the same problem with rhetorical appeals, or economic models, that are based on past performances or empirical (which also implies historical) relationships. A different approach avoids the frustration of proving history to be a fickle tutor for the future. By setting aside the supposition that we must be able to explain why the future might play out a particular way (that is, to know the ‘history’ of a possible future outcome), alternative futures 20, 50, or 100 years hence can be conceptualized as different sets of conditions that may substantially diverge from what we see today and have seen before. This perspective is employed in cross-impact balance analysis, an algorithm that searches for conditions that can be demonstrated to be self-consistent . Findings from cross-impact balance analyses have been informative for scientific assessments produced by the Intergovernmental Panel on Climate Change Research, or IPCC. To present a coherent picture of the climate change problem, the IPCC has coordinated scenario studies across economic and policy analysts as well as climate scientists since the 1990s. Prior to the development of the cross-impact balance method, these researchers had to do their best to identify appropriate ranges for rates of population growth, economic growth, energy efficiency improvements, etc. through their best judgment. A retrospective using cross-impact balances on the first Special Report on Emissions Scenarios found that the researchers did a good job in many respects. However, they underrepresented the large number of alternative futures that would result in high greenhouse gas emissions in the absence of climate policy . As part of the latest update to these coordinated scenarios, climate change researchers decided it would be useful to organize alternative futures according socio-economic conditions that pose greater or fewer challenges to mitigation and adaptation. Mitigation refers to policy actions that decrease greenhouse gas emissions, while adaptation refers to reducing harms due to climate change or to taking advantage of benefits. 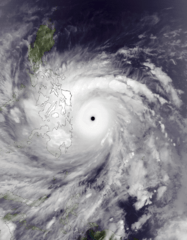 Some climate change researchers argued that it would be sufficient to consider alternative futures where challenges to mitigation and adaptation co-varied, e.g. three families of futures where mitigation and adaptation challenges would be low, medium, or high. Instead, cross-impact balances revealed that mixed-outcome futures—such as socio-economic conditions simultaneously producing fewer challenges to mitigation but greater challenges to adaptation—could not be completely ignored. This counter-intuitive finding, among others, brought the importance of quality of governance to the fore . Although it is generally recognized that quality of governance—e.g. 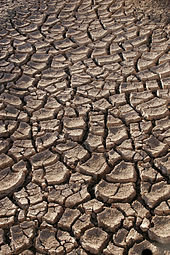 control of corruption and the rule of law—affects quality of life , many in the climate change research community have focused on technological improvements, such as drought-resistant crops, or economic incentives, such as carbon prices, for mitigation and adaptation. The cross-impact balance results underscored that should global patterns of quality of governance across nations take a turn for the worse, poor governance could stymie these efforts. This is because the influence of quality of governance is pervasive; where corruption is permitted at the highest levels of power, it may be permitted at other levels as well—including levels that are responsible for building schools, teaching literacy, maintaining roads, enforcing public order, and so forth. The cross-impact balance study revealed this in the abstract, as summarized in the example matrices below. 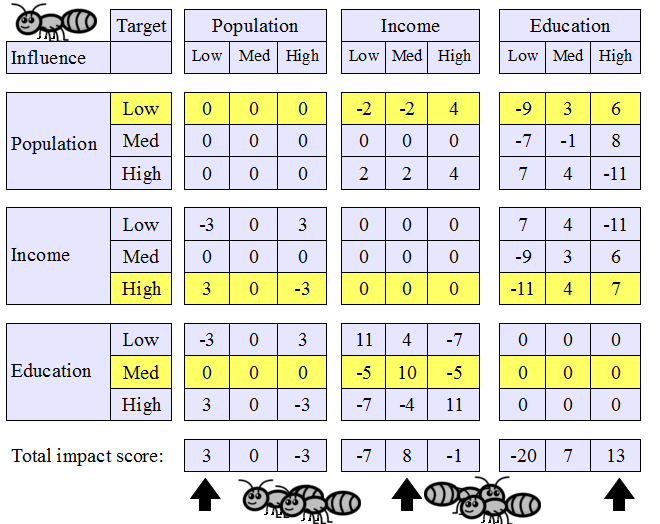 Alastair included a matrix like these in his post, where he explained that numerical judgments in such a matrix can be used to calculate the net impact of simultaneous influences on system factors. My purpose in presenting these matrices is a bit different, as the matrix structure can also explain why particular outcomes behave as system attractors. The pink rows are highlighted because of a striking property of these factors. 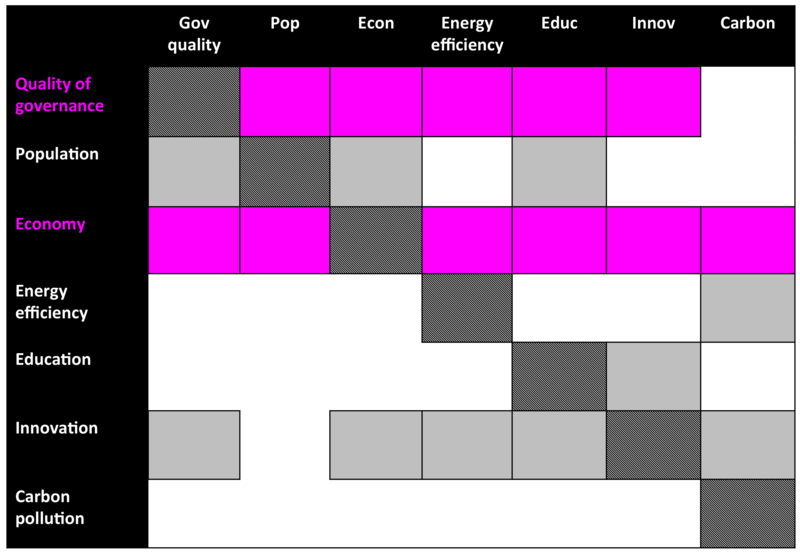 They are the two most influential factors of the system, as you can see from how many solid squares appear in their rows. The direct influence of quality of governance is second only to the economy. (Careful observers will note that the economy directly influences quality of governance, while quality of governance directly influences the economy). Other scholars have meticulously documented similar findings through observations . As a method for climate policy analysis, cross-impact balances fill an important gap between genius forecasting (i.e., ideas about the far-off future espoused by one person) and scientific judgments that, in the face of deep uncertainty, are overconfident (i.e. neglecting the ‘fat’ or ‘long’ tails of a distribution). However, alternative visions of the future are only part of the information that’s needed to create the future that is desired. Descriptions of courses of action that are likely to get us there are also helpful. In this regard, the post by Jamieson-Lane describes early work on modifying cross-impact balances for studying transition scenarios rather than searching primarily for system attractors. This is where you, as the mathematician or physicist, come in! I have been working with cross-impact balances as a policy analyst, and I can see the potential of this method to revolutionize policy discussions—not only for climate change but also for policy design in general. However, as pointed out by entrepreneurship professor Karl T. Ulrich, design problems are NP-complete. Those of us with lesser math skills can be easily intimidated by the scope of such search problems. For this reason, many analysts have resigned themselves to ad hoc explorations of the vast space of future possibilities. However, some analysts like me think it is important to develop methods that do better. I hope that some of you Azimuth readers may be up for collaborating with like-minded individuals on the challenge! M. Granger Morgan, Milind Kandlikar, James Risbey and Hadi Dowlatabadi, Why conventional tools for policy analysis are often inadequate for problems of global change, Climatic Change 41 (1999), 271–281. T.F. 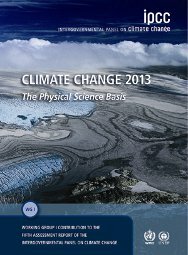 Stocker et al., Technical Summary, in Climate Change 2013: The Physical Science Basis. Contribution of Working Group I to the Fifth Assessment Report of the Intergovernmental Panel on Climate Change (2013), T.F. Stocker, D. Qin, G.-K. Plattner, M. Tignor, S.K. Allen, J. Boschung, A. Nauels, Y. Xia, V. Bex, and P.M. Midgley (eds.) Cambridge University Press, New York. Wolfgang Weimer-Jehle, Cross-impact balances: a system-theoretical approach to cross-impact analysis, Technological Forecasting & Social Change 73 (2006), 334–361. Vanessa J. Schweizer and Elmar Kriegler, Improving environmental change research with systematic techniques for qualitative scenarios, Environmental Research Letters 7 (2012), 044011. Vanessa J. Schweizer and Brian C. O’Neill, Systematic construction of global socioeconomic pathways using internally consistent element combinations, Climatic Change 122 (2014), 431–445. Daniel Kaufman, Aart Kray and Massimo Mastruzzi, Worldwide Governance Indicators (2013), The World Bank Group. Daron Acemoglu and James Robinson, The Origins of Power, Prosperity, and Poverty: Why Nations Fail. Website. The world is complex, and making choices in a complex world is sometimes difficult. As any leader knows, decisions must often be made with incomplete information. To make matters worse, the experts and scientists who are meant to advise on these important matters are also doing so with incomplete information—usually limited to only one or two specialist fields. When decisions need to be made that are dependent on multiple real-world systems, and your various advisors find it difficult to communicate, this can be problematic! The generally accepted approach is to listen to whichever advisor tells you the things you want to hear. When such an approach fails (for whatever mysterious and inexplicable reason) it might be prudent to consider such approaches as Bayesian inference, analysis of competing hypotheses or cross-impact balance analysis. Because these methods require experts to formalize their opinions in an explicit, discipline neutral manner, we avoid many of the problems mentioned above. Also, if everything goes horribly wrong, you can blame the algorithm, and send the rioting public down to the local university to complain there. In this blog article I will describe cross-impact balance analysis and a recent extension to this method, explaining its use, as well as some basic mathematical underpinnings. No familiarity with cross-impact balance analysis will be required. Since this is my first time writing a blog post here, I hear introductions are in order. I am currently a Master’s student at the University of British Columbia, studying mathematics. In particular, I’m aiming to use evolutionary game theory to study academic publishing and hiring practices… and from there hopefully move on to studying governments (we’ll see how the PhD goes). I figure that both those systems seem important to solving the problems we’ve built for ourselves, and both may be under increasing pressure in coming years. But that’s not what I’m here for today! Today I’m here to tell the story of cross-impact balance analysis, a tool I was introduced to at the complex systems summer school in Santa Fe. … and that if you do not put restrictions in place, your crops will wither and die. The merchant’s guild claims that such restrictions will cause all trade to grind to a halt. Your most trusted generals point out that weakened trade will leave you vulnerable to invasion from all neighboring kingdoms. The sailors guild adds that the wrath of Poseidon might make nautical trade more difficult. Given this complex web of interaction, it might be a good time to consult the philosophers. This brings us to the question of what CIB (Cross-Impact Balance) analysis is, and how to use it. At its heart, CIB analysis demands this: first, you must consider what aspects of the world you are interested in studying. 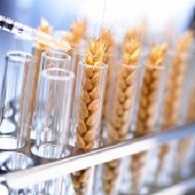 This could be environmental or economic status, military expenditure, or the laws governing genetic modification. These we refer to as “descriptors”. For each “descriptor” we must create a list of possible “states”. For example, if the descriptor we are interested in were “global temperature change” our states might be “+5 degree”, “+4 degrees” and so on down to “-2 degrees”. The states of a descriptor are not meant to be all-encompassing, or offer complete detail, and they need not be numerical. For example, the descriptor “Agricultural policy” might have such states as “Permaculture subsidy”, “Genetic engineering”, “Intensive farming” or “No policy”. For each of these states, we ask our panel of experts whether such a state would increase or decrease the tendency for some other descriptor to be in a particular state. • Elisabeth A. Lloyd and Vanessa J. Schweizer, Objectivity and a comparison of methodological scenario approaches for climate change research, Synthese (2013). For any possible combination of descriptor states (referred to as a scenario) we can calculate the total impact on all possible descriptors. In the current scenario we have low population, high income and medium education (see highlighted rows). Because the current scenario has high ant income, this strongly influences us to have low population (+3) and prevents a jump to high population (-3). This combined with the non-influence from education (zeros) leads to low population being the most favoured state for our population descriptor. Thus we expect no change. We say this is “consistent”. Education however sees a different story. Here we have a strong influence towards high education levels (summing the column gives a total of 13). Thus our current state (medium education) is inconsistent, and we would expect the abundance of ant wealth to lead to an improvements in the ant schooling system. Classical CIB analysis acts as a way to classify which hypothetical situations are consistent, and which are not. Now, it is all well and good to claim that some scenarios are stable, but the real use of such a tool is in predicting (and influencing) the future. By applying a deterministic rule that determines how inconsistencies are resolved, we can produce a “succession rule”. The most straight-forward example is to replace all descriptor states with whichever state is most favoured by the current scenario. In the example above we would switch to “Low population, medium income, high education”. A generation later we would switch back to “Low population, High income, medium education”, soon finding ourselves trapped in a loop. All such rules will always lead to either a loop or a “sink”: a self consistent scenario which is succeeded only by itself. So, how can we use this? How will this help us deal with the wrath of the gods (or ant farms)? Firstly: we can identify loops and consistent scenarios which we believe are most favourable. It’s all well and good imagining some future utopia, but if it is inconsistent with itself, and will immediately lead to a slide into less favourable scenarios then we should not aim for it, we should find that most favourable realistic scenario and aim for that one. Secondly: We can examine all our consistent scenarios, and determine whose “basin of attraction” we find ourselves in: that is, which scenario are we likely to end up in. 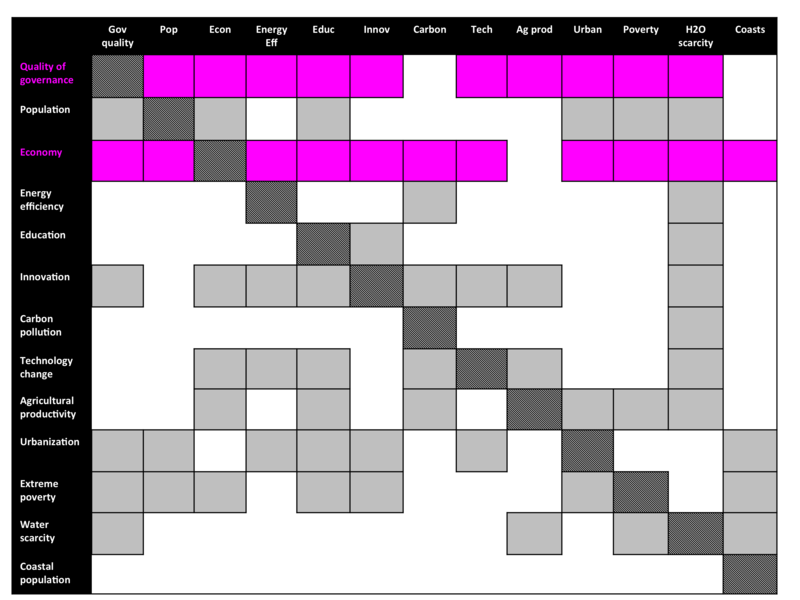 Thirdly: Suppose we could change our influence matrix slightly? How would we change it to favour scenarios we most prefer? If you don’t like the rules, change the game—or at the very least find out WHAT we would need to change to have the best effect. So… what are the problems we might encounter? What are the drawbacks? Well, first of all, we note that the real world does not tend to reach any form of eternal static scenario or perfect cycle. The fact that our model does might be regarded as reason for suspicion. Secondly, although the classical method contains succession analysis, this analysis is not necessarily intended as a completely literal “prediction” of events. It gives a rough idea of the basins of attraction of our cycles and consistent scenarios, but is also somewhat arbitrary. What succession rule is most appropriate? Do all descriptors update simultaneously? Or only the one with the most “pressure”? Are our descriptors given in order of malleability, and only the fastest changing descriptor will change? Thirdly, in collapsing our description of the world down into a finite number of states we are ignoring many tiny details. Most of these details are not important, but in assuming that our succession rules are deterministic, we imply that these details have no impact whatsoever. If we instead treat succession as a somewhat random process, the first two of these problems can be solved, and the third somewhat reduced. In the classical CIB succession analysis, some rule is selected which deterministically decides which scenario follows from the present. Stochastic succession analysis instead tells us the probability that a given scenario will lead to another. The simplest example of a stochastic succession rule is to simply select a single descriptor at random each time step, and only consider updates that might happen to that descriptor. This we refer to as dice succession. This (in some ways) represents hidden information: two systems that might look identical on the surface from the point of view of our very blockish CIB analysis might be different enough underneath to lead to different outcomes. If we have a shaky agricultural system, but a large amount of up-and-coming research, then which of these two factors becomes important first is down to the luck of the draw. Rather than attempt to model this fine detail, we instead merely accept it and incorporate this uncertainty into our model. Even this most simplistic change leads to dramatics effects on our system. Most importantly, almost all cycles vanish from our results, as forks in the road allow us to diverge from the path of the cycle. Here is our current scenario, is some possible future scenario, and is the total impact score of from the perspective of . is a simple normalizing constant, and is our system’s temperature. High temperature systems are dominated by random noise, while low temperature systems are dominated by the influences described by our experts. Here each bracket refers to the sum of a particular column. Here refers to an entry in our cross-impact balance matrix, and are both states, and reads as “ is a state of ”. We refer to this function for computing transition probabilities as the Boltzmann succession law, due to its similarity to the Boltzmann distribution found in physics. We use it merely as an example, and by no means wish to imply that we expect the transitions for our true system to act in a precisely Boltzmann-like manner. Alternative functions can, and should, be experimented with. The Boltzmann succession law is however an effective example and has a number of nice properties: is always positive, unchanged by adding a constant to every element of the cross-impact balance matrix, contains adjustable parameters, and unbounded above. The Boltzmann succession rule is what I will refer to as fully stochastic: it allows transitions even against our experts’ judgement (with low probability). This is in contrast to dice succession which picks a direction at random, but still contains scenarios from which our system can not escape. ‘Partially stochastic’ processes such as the dice rule have very limited effect on the long term behavior of the model. Aside from removing most cycles, they behave almost exactly like our deterministic succession rules. So, let us instead discuss the more interesting fully stochastic succession rules. By asking this question we can get some idea of the relative importance of all our future scenarios and states. For example, if the scenario “high population, low education, low income” has a 40% probability in the long term, while most other scenarios have a probability of 0.2%, we can see that this scenario is crucial to the understanding of our system. Often scenarios already identified by deterministic succession analysis are the ones with the greatest long term probability—but by looking at long term probability we also gain information about the relative importance of each scenario. 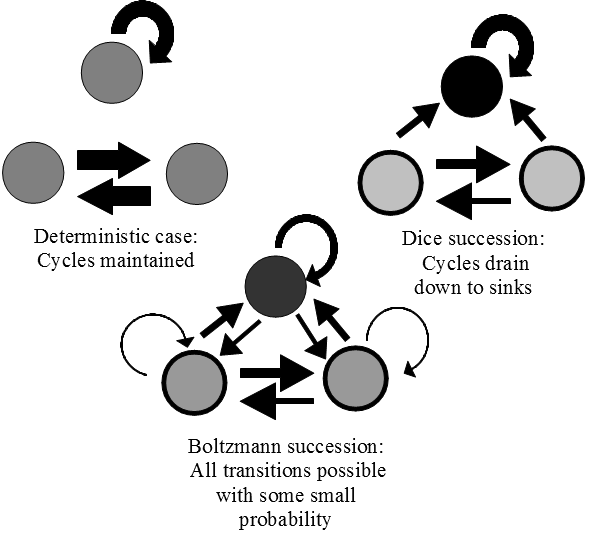 In addition, we can encounter scenarios which are themselves inconsistent, but form cycles and/or clusters of interconnected scenarios. We can also notice scenarios that while technically ‘consistent’ in the deterministic rules are only barely so, and have limited weight due to a limited basin of attraction. We might identify scenarios that seem familiar in the real world, but are apparently highly unlikely in our analysis, indicating either that we should expect change… or perhaps suggesting a missing descriptor or a cross-impact in need of tweaking. Armed with such a model, we can investigate what we can do to increase the short term and long term likelihood of desirable scenarios, and decrease the likelihood of undesirable scenarios. • Wolfgang Weimer-Jehle, Cross-impact balances: a system-theoretical approach to cross-impact analysis, Technological Forecasting & Social Change 73 (2006), 334–361. • Wolfgang Weimer-Jehle, Properties of cross-impact balance analysis. ZIRIUS is the Research Center for Interdisciplinary Risk and Innovation Studies of the University of Stuttgart. • Gerhard Fuchs, Ulrich Fahl, Andreas Pyka, Udo Staber, Stefan Voegele and Wolfgang Weimer-Jehle, Generating innovation scenarios using the cross-impact methodology, Department of Economics, University of Bremen, Discussion-Papers Series No. 007-2008. • Ortwin Renn, Alexander Jager, Jurgen Deuschle and Wolfgang Weimer-Jehle, A normative-functional concept of sustainability and its indicators, International Journal of Global Environmental Issues, 9 (2008), 291–317. • ZIRIUS, Cross-impact balance analysis: publications. Puzzle. The European Union has a goal of producing 20% of all its energy from renewable sources by 2020. Right now, which source of renewable energy does the EU use most? Think about it a bit before reading further! In its various forms, from sticks to pellets to sawdust, wood (or to use its fashionable name, biomass) accounts for about half of Europe’s renewable-energy consumption. In some countries, such as Poland and Finland, wood meets more than 80% of renewable-energy demand. Even in Germany, home of the Energiewende (energy transformation) which has poured huge subsidies into wind and solar power, 38% of non-fossil fuel consumption comes from the stuff. • Eurostat, Renewable energy statistics. says that in 2010, 67.6% of primary renewable energy production in the EU came from “biomass and waste”. This is at least compatible with The Economist‘s claims. Hydropower accounted for 18.9%, wind for 7.7%, geothermal for 3.5% and solar for just 2.2%. It seems that because wood counts as renewable energy in the EU, and there are big incentives to increase the use of renewable energy, demand for wood is booming. According to the Economist, imports of wood pellets into the EU rose by 50% in 2010 alone. They say that thanks to Chinese as well as EU demand, global trade in these pellets could rise five- or sixfold from 10-12 million tonnes a year now to 60 million tonnes by 2020. Either way, it’s interesting that we always hear about the rising use of wind and solar in the EU, but not about wood. Can you find more statistics or well-informed discussions about wood as a renewable energy source? 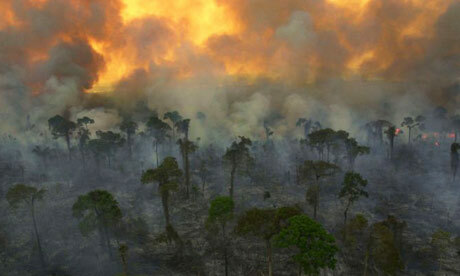 • Wood: the fuel of the future, The Economist, 6 April 2013. If its facts are wrong, I’d like to know. P.S. – This is the 400th post on this blog! For long-time readers here the fun comes near the end. I explain how reaction networks can be used to describe evolutionary games. I point out that in certain classes of evolutionary games, evolution tends to increase ‘fitness’, and/or lead the players to a ‘Nash equilibrium’. For precise theorems you’ll have to click the links in my talk and read the references! • William H. Sandholm, Evolutionary game theory, 2007. • Fisher’s fundamental theorem of natural selection. But not today! Think of these talk slides as a little appetizer.